Halvorsen build number 57-26 just after her launch in July 1989. Halvorsen Custom 57 completed in 1989. It's not often that one gets the opportunity to build a new Halvorsen boat at the age of 25 in Hong Kong then have the privilege of undertaking a major restoration on the same boat for the current owners 25 years later at Bobbin Head! 'Safari' as she is now named was originally christened 'Cowabie' and built in our factory at Tsing Yi Island in Hong Kong and launched as a Custom design 57' in July 1989. Trevor Gowland the General Manager of Halvorsen Boats in Sydney Australia penned the one off deck and wheelhouse design for the original clients Mr. and Mrs. Graham and Carol Morrow. The brief from Graham was speed and maximum accommodation. So after much back and forth it was decided to supply and install a pair of 12V92GM Detroit diesels with a rated horse power each of 1,080. As our hull shape below the waterline is of semi displacement form which limits the max top end speed through the water due to hull drag we insisted that the owner sign a waiver. It was noted at the time that during sea trials in Hong Kong she topped out at an impressive 24 knots light load. The above photos show the boat at various stages of her construction. Within approximately 2 years of her arrival into Sydney she was sold. The new owner at that time decided to add an additional 8' to the stern of the boat in the form of an integrated fishing cockpit. This work was carried out in Sydney to a high standard with the involvement of a Naval Architect. It was decided to leave the propeller shaft assemblies in their original location but move the rudder stocks back. It is understood that since 1992 there have been 5 owners and during this time period many changes/additions and modifications were made to many aspects of the interior and exterior and unfortunately as a result she had become somewhat tired and neglected. In July of 2012 I was privileged to meet the new owners of Safari Mr. and Mrs. Upton who had just purchased her a month before from Mr. Dodds. Through word of mouth they had contacted me and after some initial discussions on-board they requested I undertake the project management and restoration for them. Safari being lifted out of the water January 2013 ready for her major restoration work to begin. Photo taken at Empire Marina Bobbin Head. Before Safari was taken out of the water some initial restoration work was carried out between August and December 2012 primarily to the interior spaces. This involved the removal and re-bedding of nearly all the saloon main windows, replacing a large portion of the saloon and galley interior side panel teak veneers with new as they were painted black, reconfiguration of the galley with the replacement of all appliances with a brand new fridge/freezer unit, microwave and cook top. The saloon floor was ripped up as a previous owner had laid a domestic type timber clip lock floor. The wheelhouse had a brand new wine fridge and under counter fridge installed and the enclosed aft deck area had the built in seat removed and an integrated cabinet with under counter fridge and freezer units installed in its place - all capped off with a beautiful Corian free form counter top. Additional exterior photos showing Safari prior to the commencement of the major restoration work. Safari spent almost 10 months out of the water up on the hard stand at Empire Marina at Bobbin Head in 2013. It was during this period that the complicated and extensive restoration work was undertaken. There were several major areas around the boat that required a large amount of pre-planning prior to any commencement of work as several trades had to be utilized at the same time to effectively undertake these works. This included shipwrights, marine electricians, marine engineers, hardstand staff and general hands. Priority was given to the engine room area as the 3 remaining black iron fuel tanks at the rear of this compartment needed to be removed from the boat! In order to achieve this it was not as simple as lifting up the saloon floor and extracting them through the main door or a window. The twin GM 12V92 1080hp Detroit Diesel main engines made it impossible. There just wasn't enough space for this. So a decision was made to cut a 2.5m x 3m opening in the hull port side at point adjacent to these fuel tanks. This would allow us to systematically remove the exiting fuel tanks, existing/original Westerbeke generator set and fridge/freezer compressor unit. It would also allow us to expose all of the original bronze thru hull skin fittings as the vast majority required removal. ( In total 36 of these were removed from the hull with a total of 10 new ones added back in). 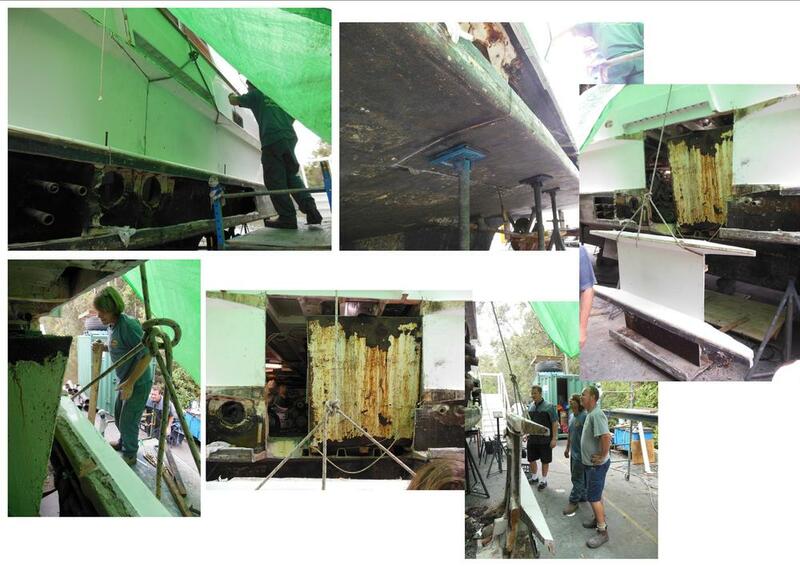 Photo montage showing the delicate cutting operation & removal of the hull section adjacent to the port side fuel tank.